Organisations and enterprises are expected to increase their digital expenditure as chief information officers (CIOs) aim to accelerate digital transformation, according to a research study and testimony provided by 100 different CIOs who attended the TechCircle 7 Digital Dialogues Summit. More than 55% of organisations will increase their technology expenditure, according to the study conducted by Edge, the research arm of Mosaic Digital. The study, which surveyed technology leaders from across 900 Indian enterprises, also showed that digital sales and marketing would record the maximum expenditure with more than half of the companies aiming to transform these departments. Other areas of focus include strategy and architecture (40%), customer satisfaction (39%) and customer service (38%). Out of a total expenditure of $8.5 billion on technology estimated for 2019, the study predicted that Internet of Things (IoT) will lead the pack with an outlay of $1.92 billion followed by cloud at $1.58 billion and future workforce and security at $1.42 billion. According to the study, use-cases in areas such as manufacturing, logistics, supply chain and healthcare are driving the commercialisation of IoT as enterprises want real-time data and insights from machines or customers. The use of IoT can bring down labour and transportation costs by 30% and reduce machine downtime by 12%, it showed. The study further showed that cloud technology is undergoing a digital evolution of its own and will soon evolve from software-as-service (SaaS) and infrastructure-as-a-service (IaaS) to everything-as-a-service (XaaS). Security, another big area on which companies will look to spend money, is also undergoing a transformation where digital will have to be married to hardware in order to provide holistic and real-time safeguards as opposed to prevention techniques used in the past. Other technologies such as artificial intelligence (AI), social and augmented reality & virtual reality (AR/VR) follow in the expenditure list with $0.80 billion, $0.60 billion and $0.19 billion respectively. According to a KPMG study, implementation of robotic process automation (RPA), chatbots and voicebots can result in an increase in productivity. The study, which focuses on the use case of filing taxes, claims that RPA can hike productivity by 30% and bring down approximately 30,000 man hours needed for tax compliance. "Leaders are today attempting to challenge their organisations to ensure that this technology-enabled change unlocks new revenue streams, experiential innovation, margins and enhances competitive advantage -- value creation at scale," said Jaideep Mehta, CEO of Mosaic Digital. Several CIOs, who attended the summit, also said that Indian enterprises had begun their digital transformation journeys but were dealing with the initial challenges of deployment. While Anil Purohit, CIO of Yes Bank, said that banks were just exploring the tip of the iceberg in terms of frontier technologies at the moment, he added that these technologies will grow in the next five years. Vijay Sethi of Hero Motocorp, on the other hand, said that while technologies such as social, AR and VR are expected to grow, companies need to start spending on re-skilling their employees on digital technologies. Sumit Puri, CIO of Max Healthcare, also seconded Sethi and said that in order to achieve digital transformation, companies need to start investing in building the future workforce in order to increase productivity and in turn increase revenue. Alternatively, Meenakshi Vijay, CIO of telecom giant Vodafone Idea, said that digital transformation is like looking for new answers to old questions and some of the problems include old clunky IT infrastructure, complex products and a customer who needs speedy resolution. 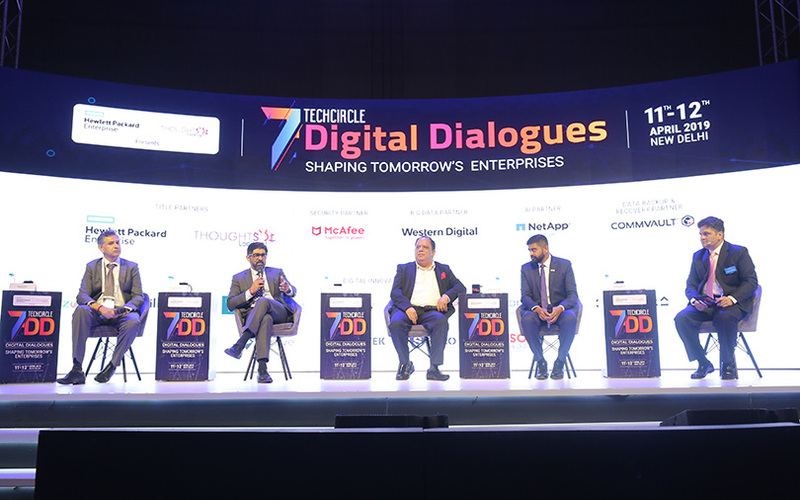 Other CIOs from organisations such as Kwality Ltd, Havells and Cloud Nine Hospitals said that they too had embarked on digital transformation journeys and were using a lot of them in a collaborative manner to gradually digitise departments such as supply chain, operations and marketing.